Junk Masterz can take just about anything, as long as it’s non-hazardous and can be lifted by our team. Our team is happy to meet all of your Las Vegas junk hauling needs. To get started, book online or schedule a time for us to stop by and give you a quote. You can also call us at (702) 850-5865. We can often be there on the same day! Stop parking your car in the driveway, while the stuff you never use is nice and protected inside the garage. Large Appliances like refrigerators, washers and dryers can be hauled away along with furniture, mattresses, sporting goods, lumber, lawn equipment, clothing and boxes and bags full of miscellaneous items. If you are moving from your home or already have, chances are you have some boxes or other items that you would like to get rid of. In some cases, the previous owners may have left the items behind like large appliances, furniture, and other items. Junk Masterz can get rid of any and all of those items and much more. We've come to understand that when a loved one passes away, the last thing you want to worry about is cleaning up their apartment or house. We realize that house is filled with tons of memories for you and your family and it will be very difficult to move on. We are very proud to have the opportunity to help our customers in their time of need. We know that we must be both efficient and understanding when cleaning out an estate as our customers focus on what matters most to them in their time of grief. Once organized, we help families transport and donate items that belong to departed family members. Letting their memories live on as their furniture is used by another local family in need. Bank & Real Estate Agents can also work with Junk Masterz to handle Foreclosed homes or other distressed properties. We Make this process affordable and easy with upfront pricing, easy scheduling, and fast service. At Junk Masterz, we offer property clean-out services to help families during what may be a difficult time. Following a major life change, you may need an estate property clean-out to take care of the leftover items and stray garbage. Junk Masterz offers the friendly, fast, and professional service you need to get this taken care without any additional stress. Are you a Landlord or Property Manager who recently evicted your tenant or are you a tenant and your lease just ended, leaving your property with trash & furniture behind? Junk Masterz property clean-out services help you get the property prepared for leasing. We can speed up your turnaround time and have your rental property completely cleaned out within a few hours. As a property manager or owner, you have enough on your plate. Consider Junk Masterz junk removal an extension of your team. We're here when you need us, ready to help whip your property into shape. 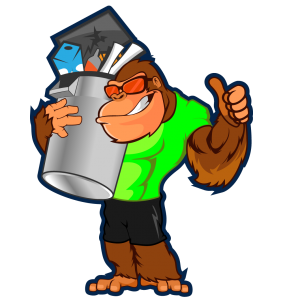 We'll remove whole units full of garbage, discarded furniture, and other debris. And we'll leave the property swept clean. We do not pickup any hazardous items. If it seems like we don’t take what you have please give us a call and we will try to work with you. We are flexible and might be able to point you in the right direction.